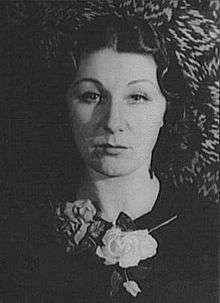 Dame Judith Anderson, AC, DBE (born Frances Margaret Anderson, 10 February 1897 – 3 January 1992) was an Australia-born British actress who had a successful career in stage, film and television. A preeminent stage actress in her era, she won two Emmy Awards and a Tony Award and was also nominated for a Grammy Award and an Academy Award. She is considered one of the century's greatest classical stage actors. Frances Margaret Anderson was born in 1897 in Adelaide, South Australia, to Jessie Margaret (née Saltmarsh; 19 October 1862 – 24 November 1950) and James Anderson Anderson. She attended a private school - Norwood. She began acting in Australia before moving to New York in 1918. Anderson established herself as a dramatic actress of note, making several appearances in Shakespearean plays. She maintained her birth name as her legal name, never legally taking the forename "Judith" as per the California Death Index registry. She made her professional debut (as Francee Anderson) in 1915, playing Stephanie at the Theatre Royal, Sydney, in A Royal Divorce. Leading the company was the Scottish actor Julius Knight whom she later credited with laying the foundations of her acting skills. In the company were some American actors who convinced Anderson to try her luck in the United States. She travelled to California but was unsuccessful, then moved to New York, with an equal lack of success. After a period of poverty and illness, she found work with the Emma Bunting Stock Company at the Fourteenth Street Theatre in 1918–19. She toured with other stock companies until 1922 when she made her Broadway debut in On the Stairs using her true name, Frances Anderson. One year later, she had changed her acting forename (albeit not for legal purposes) to Judith and had her first triumph with the play Cobra co-starring Louis Calhern. She toured Australia in 1927 with three plays: Tea for Three, The Green Hat and Cobra. By the early 1930s, she had established herself as one of the most prominent theatre actresses of her era and she was a major star on Broadway throughout the 1930s, 1940s and 1950s. In 1931, she played the Unknown Woman in the American premiere of Pirandello's As You Desire Me, filmed the following year with Greta Garbo in the same role. This was followed by Eugene O'Neill's Mourning Becomes Electra, Luigi Chiarelli's The Mask and the Face, with Humphrey Bogart and Zoë Akins' The Old Maid from the novel by Edith Wharton, in the role later played on film by Miriam Hopkins. In 1936, Anderson played Gertrude to John Gielgud's Hamlet in a production which featured Lillian Gish as Ophelia. In 1937, she joined the Old Vic Company in London and played Lady Macbeth opposite Laurence Olivier in a production by Michel Saint-Denis, at the Old Vic and the New Theatre. In 1941, she played Lady Macbeth again in New York opposite Maurice Evans in a production staged by Margaret Webster, a role she was to reprise with Evans on television, firstly in 1954 and then again in 1960 (the second version was released as a feature film in Europe). In 1942–43, she played Olga in Chekhov's Three Sisters, in a production which also featured Katharine Cornell, Ruth Gordon, Edmund Gwenn, Dennis King and Alexander Knox. (Kirk Douglas, playing an orderly, made his Broadway debut in the production.) The production was so illustrious, it made it to the cover of Time. In 1947, she triumphed as Medea in a version of Euripides' tragedy, written by the poet Robinson Jeffers and produced by John Gielgud, who played Jason. She was a friend of Jeffers and a frequent visitor to his home "Tor House" in Carmel, California. She won the Tony Award for Best Actress for her performance. She toured in this role to Germany in 1951 and to France and Australia in 1955–56. In 1953, she was directed by Charles Laughton in his own adaptation of Stephen Vincent Benét's John Brown's Body with a cast also featuring Raymond Massey and Tyrone Power. In 1960, she played Madame Arkadina in Chekhov's The Seagull first at the Edinburgh Festival, and then at the Old Vic, with Tom Courtenay, Cyril Luckham and Tony Britton. In 1970, she realised a long-held ambition to play the title role of Hamlet on a national tour of the United States and at New York's Carnegie Hall. In 1982, she returned to Medea, this time playing the Nurse opposite Zoe Caldwell in the title role. Caldwell had appeared in a small role in the Australian tour of Medea in 1955–56. She was nominated for the Tony Award for Best Performance by a Featured Actress in a Play. In Hollywood, her opportunities were limited to supporting character actress work. She naturally preferred the stage in any event. In particular, she was nominated for an Academy Award for Best Supporting Actress for her role in Alfred Hitchcock's Rebecca (1940). As the housekeeper Mrs. Danvers, Judith Anderson was required to mentally torment the young bride, the "second Mrs. de Winter" (Joan Fontaine), even encouraging her to commit suicide; and taunt her husband (Laurence Olivier) with the memory of his first wife, the never-seen "Rebecca" of the title. This role led to several film appearances during the 1940s in such films as Lady Scarface (1941), Kings Row (1942), All Through the Night (1942), Otto Preminger's Laura (1944) with Gene Tierney, Ben Hecht's Specter of the Rose (1946), Jean Renoir's The Diary of a Chambermaid (1946) and a particularly memorable turn as Emily Brent in René Clair's And Then There Were None (1945). In 1970, she acted alongside Richard Harris in the controversial film A Man Called Horse. She continued to act on the New York stage, winning a Tony Award in 1948 for her performance in the title role of Medea. Her stage and film work continued and by the 1950s she was also appearing in television productions. On the big screen, she played a golddigger in Anthony Mann's western The Furies (1950), Herodias in Salome (1953) and Memnet in Cecil B. DeMille's epic The Ten Commandments (1956). 1n 1958, Anderson played the memorable role of "Big Mama" alongside "Big Daddy" Burl Ives, in the screen adaptation of Tennessee Williams' play, Cat on a Hot Tin Roof. She also recorded many spoken word record albums for Caedmon Audio from the 1950s to the 1970s, including her performance as Lady Macbeth (opposite Anthony Quayle). Other recordings include an adaption of Medea, Robert Louis Stevenson verses, and readings from the Bible. She received a Grammy nomination for her work on the Wuthering Heights recording. Anderson began an active career in television in the early 1950s, usually starring in prestigious "event" dramas such as recreating her role as Medea in 1959 and two separate productions of Macbeth in 1954 and 1960, winning the Emmy Award for both filmed performances as Lady Macbeth. Anderson was a frequent star of Hallmark Hall of Fame productions, and was featured in the TV special Light's Diamond Jubilee (1954), broadcast on all four TV networks of the time, and produced by David O. Selznick. Also in 1959, she guest starred on Wagon Train, in The Felizia Kingdom Story. In her later years, she played two more prominent roles in productions that took her as far away from her Shakespearean origins as possible. In 1984, she appeared in Star Trek III: The Search for Spock as the Vulcan High Priestess T'Lar. That same year, she commenced a three-year stint as matriarch Minx Lockridge on the NBC serial Santa Barbara. She had professed to be a fan of the daytime genre, but after signing the contract, she complained about her lack of screen time. The highlight of her stint was when Minx tearfully revealed the horrific truth that she had switched the late Channing Capwell with Brick Wallace as a baby, preventing her illegitimate grandson from being raised as a Capwell. This resulted in her receiving a Supporting Actress Emmy Nomination although her screen time afterwards diminished to infrequent appearances. After leaving the series, she was succeeded in the role by the quarter-century younger American actress Janis Paige. Anderson loved Santa Barbara, California, and spent much of her life there. She died there, of pneumonia, in 1992. 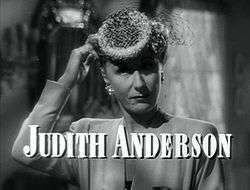 ↑ "Judith Anderson Biography". Yahoo! Movies. 2008. Retrieved 11 May 2008. ↑ "Current Biography Yearbook, Volume 2". H.W. Wilson Co., 1941. Retrieved 31 October 2016. Judith Anderson was born in Adelaide, South Australia, the ... to give the girl eight years of good schooling at two private institutions in South Australia, Rose Park and Norwood. ↑ Anne Heywood (7 May 2003). "Anderson, Frances Margaret (Judith)". Australian Women's Archives Project. National Foundation for Australian Women. Retrieved 11 May 2008. ↑ "Anderson, Frances Margaret (known as Judith) 1897-1992". SA Memory. State Library of South Australia. Retrieved 5 March 2015. ↑ Dixon, Robert; Kelly, Veronica, eds. (1 Jan 2008). Impact of the Modern: Vernacular Modernities in Australia 1870s-1960s. Sydney University Press. ISBN 9781920898892. ↑ Gish, Lillian (1973). Dorothy and Lillian Gish. New York City: Charles Scribner's Sons. p. 206. ISBN 9780333153925. ↑ "TIME Magazine Cover: Katharine Cornell, Judith Anderson & Ruth Gordon". Time.com. 21 December 1942. Retrieved 27 July 2010. ↑ Hicks, Jack (2000). The Literature of California: Native American beginnings to 1945. Berkeley and Los Angeles: University of California Press. p. 641. ISBN 0-520-21524-9. ↑ Benjamin Harrison Lehman, English; Dramatic Art: Berkeley (1889-1977), Professor of English, Emeritus profile, accessed August 19, 2014. ↑ "Luther Greene Is Dead; Landscaper, Producer". New York Times. 4 June 1987. ↑ "It's an Honour: DBE". Itsanhonour.gov.au. 1 January 1960. Retrieved 2 August 2010. ↑ "Australian Honours: Anderson, Judith". It's an Honour. Australian Government. 2008. Retrieved 11 May 2008. ↑ Kirby, Walter (May 10, 1953). "Better Radio Programs for the Week". The Decatur Daily Review. p. 50. Retrieved 27 June 2015 – via Newspapers.com.